Elvis has become our Hercules: a hero on the way to becoming a god. When I hear, in “Almost Elvis,” that “Elvis is a name for something that we have in us, or we don’t,” it is hard not to think about the similar statements for other gods and divinities. You can hardly read modern fantasy without running into a “king” who keeps popping up at the most unlikely places. Most of the time he’ll be in heaven, but Douglas Adams puts him (and his pink chromed space ship) in “The Domain of the King Bar and Grill,” a spacers bar on a far-off desert planet. Agent Jones, in “Men in Black,” tells us that “Elvis isn’t dead. He just went home.” A couple of years ago I saw an independent movie with a better title than story, called “Six String Samurai” in which Elvis, the King of Lost Vegas (the last free city in a Russian-controlled United States) has died, and guitarists from around the country converge to vie for the throne. The subtitle is “Elvis Impersonators and Their Quest for the Crown”. The movie follows a couple of Elvis impersonators (they’re called “Elvis Stylists” for part of the movie) through the regional contests that determine who gets to go to the Elvis World Championship of 1999, in Memphis, the “Miss America of Elvis contests”. Irv Cass, from Niles, Michigan, has come close to winning in the past. But is he getting too old? Quentin Flagg from Argos, Indiana, is “young Elvis”. He’s fifteen years old (at the time) and has a paper route. But Elvis didn’t start his career until he was 18. Does that make Quentin too young? Robert Washington has the stylings and the music down nearly perfectly. But he’s also black. Does that mean he doesn’t have “the total package”? Everyone talks about the total package. Who has it? What is it? It’s the style, the voice, the clothes, the charisma. Part of “the total package” is having an Elvis jumpsuit. The movie detours through the sewing rooms of B & K Enterprises, where you can spend a few grand to get a rhinestone-embedded jumpsuit made, they explain, from the original patterns. They explain how the costume was designed to turn Elvis into a superhero, like Captain Marvel. One of the most disappointing aspects of the movie, to me, is the lack of Elvis music in it. You never get to hear an entire song all the way through. The movie is completely about the impersonators outside of the stage. Once they get on stage, the camera usually switches to the audience or to a side-trek such as the jumpsuit makers or Elvis impersonator agents. The DVD has some nice bits to it, although it doesn’t support bookmarking your place (Last Memo). One of the nicer “little things” is that in scene selection you can cycle backwards from the first to last, making it easier to go to the end of the chapter listing. The DVD automatically starts playing if you leave it on the main menu for a few minutes—even after you’ve watched it once, which is another pet peeve of mine. If you leave it on the main menu after watching it, it will start all over again. The DVD includes a number of extras. The extras menus have an annoying tendency to “time out” and revert to the previous menu. One of the extras is a “trailer”, but the trailer is nine minutes long. I doubt it was ever used as an actual trailer. It’s more of a mini-documentary, and it includes some photos that didn’t appear in the movie, and I’m pretty sure some footage that didn’t appear also. 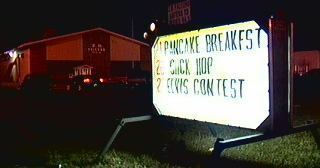 It also introduces the word “Elvii” as a plural for Elvis. It also is true to the documentary in that the songs over the trailer aren’t Elvis or Elvis impersonators. The “Making of” is a series of written texts that gives a very simple timeline that includes the director’s mother catering a party, and one of the crew “defecting” to enter in an Elvis contest. “Character Bios” includes a short bio on the six main Elvis impersonators highlighted in the movie. The bios, while short, are made more interesting by focussing on what the Elvii have done since the documentary was made. They’re written succinctly and with good humor. 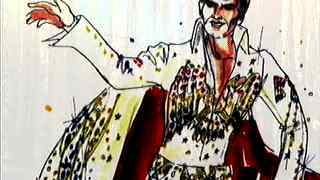 The “History of Elvis Impersonators” is another short, including “Elvis Scholar” Professor Vernon Chadwick, is also marred by out-of-sync audio. It includes some very interesting information on Elvis impersonators from back when Elvis was alive. Short and to the point, it is almost better than the full documentary. The “Extra Scenes” are interesting, if for nothing else because it contains footage of El Vez, the Mexican Elvis. I’ve seen him in concert in a local bar a couple of times, and if you have the chance I strongly recommend it. He puts on a great show. 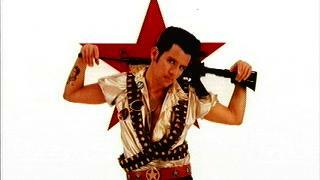 Apparently, the idea for “Almost Elvis” came from the director seeing El Vez in Albuquerque. Unfortunately, El Vez didn’t make the cut for the documentary. This makes sense, as he really deserves his own, and he didn’t fit with the “quest for the crown” focus that the documentary took. 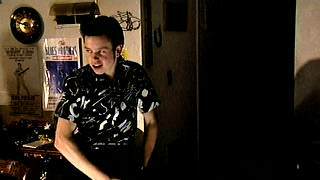 Some of the other deleted scenes fit the same model: shorts on Elvis impersonators who didn’t fit with the movie’s theme but are interesting enough to put on the DVD. This is what makes DVD the powerful medium it can be. With all that good stuff, this DVD has to take the prize for silliest DVD extra: it has four famous people’s photos, with Elvis sideburns and jumpsuits superimposed over them. The game is to guess who the photos are. Finally, the commentary by directory John Paget, associate producer David Ross, director of photography Matt Valentine, and “sound guy” Michael Elvin, is just them yakking about the movie. It’s enjoyable, although filled with quiet spots. “I just figured, hell, somebody can do a documentary on a pet cemetary and that’s funny as hell, so this’ll be great.” Interestingly, they obviously did the commentary last, as they know what is on the rest of the DVD. When David Ross refuses to talk about his stint as an Elvis impersonator, one of the others tells us to just go to the extras and read the “Making of” to find out more. “Wow, excellent.” They get funnier as they go along also. The documentary starts out slow, but gets comfortable pretty quickly. In two places, the choice of music is pretty cheesy. (Then again, the choice of topic is pretty cheesy, and it’s still enjoyable.) “Also Sprach Zarathustra,” the same as the famous music from 2001, just doesn’t fit. Why not some Elvis music? However, I definitely enjoyed the movie and the DVD’s extras. While it may not be something to watch over and over again (and if it is, I think you know who you are) I definitely recommend a rental. The movie has apparently gotten some awards, but I don’t pay enough attention to awards to know which ones are worth something and which aren’t. I couldn’t even say who won at last year’s Academy Awards, I have no idea what it means to be the “best documentary” at WorldFest 2000, or to take first place for documentary at the Houston International Film Festival. Other reviewers are calling it “a great choice for Elvis fans”, which is probably true, but I think misses the point. This is for people who are fascinated by Elvis impersonators more than by Elvis himself, and want to watch them in their natural habitat. I didn’t purchase this movie, I was sent a review copy. I don’t know why, but I suspect that they saw how much I liked “Priscilla, Queen of the Desert,” and decided that if I liked that I’d also like a movie about a bunch of guys dressing up in jeweled jumpsuits. They were right, of course. I can complain about there not being enough Elvis music, about not hearing many (if any) songs all the way through, about the ridiculously long “trailer”, about the inability to watch it in parts, but it’s still a lot of fun. Rent it or buy it, I recommend it on DVD. If you enjoy campy, you might also be interested in Flash Gordon. If you enjoy musical, you might also be interested in A Star is Born, Amadeus, Cabaret, Going My Way/Holiday Inn, Hair, Jesus Christ Superstar, The Adventures of Priscilla, Queen of the Desert, The Blues Brothers, The Music Man, The Rocky Horror Picture Show, The Sound of Music, and The Wizard of Oz. This documentary was a lot of fun. Elvis isn’t dead, he just got released straight to video. Almost Elvis last modified February 24th, 2009.